Republicans, finding themselves less able to win elections on the merits of their candidates and policy positions, are continuing to tinker with election processes at the state level to disadvantage voters who disagree with their policies and dislike their candidates. In 2010 and 2011, Republicans worked frenetically in state legislatures to pass so-called “voter ID” laws, which, just prior to the election, were officially outed as a strategy to make voting harder for the people most likely to vote against their candidates: African Americans, the elderly, the poor, students and those with disabilities. As voter ID laws were increasingly discredited and blocked by the courts, Republicans started working on a new strategy: REDMAP, short for “Redistricting Majority Project,” an effort to skew the redistricting process to assure Republicans maintain their majority in the U.S. House of Representatives even though more Democrats than Republicans are now casting ballots across the country. 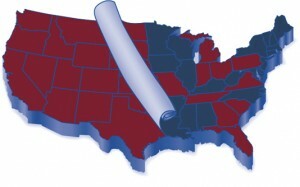 The GOP’s REDMAP strategy involves a plan to win control of state legislatures. Once they achieve that, they initiate an aggressive gerrymandering campaign to redraw the states’ electoral maps and create districts that are completely safe for Republicans. But beyond eliminating competitive elections in Congressional races, a new part of the GOP’s strategy is to change the rules about how the states apportion their electoral college votes. The new strategy will magnify the effect of Republican votes in the Electoral College in future elections. The GOP wants to change the current winner-take-all rule for apportioning electoral college votes to instead apportioning electoral votes based on the winner in each individual Congressional district within the state. The change would hand beleaguered Republicans a huge process advantage over Democrats. As an example, if the GOP’s hoped-for rule had been in place in Pennsylvania in the November, 2012 election, for example, Mitt Romney would have won 13 of that state’s 20 electoral college votes, even though Obama won the state with 52 percent of the popular vote.